This year, eccentric rock legend David Bowie would’ve been 72 years old. The controversial man is known for his dramatic music transformations, including his character Ziggy Stardust, as well as being a leading figure in the music industry. He is considered to be one of the most influential musicians of the 20th century. Not to mention that he also was a great artist, songwriter, and even an actor! 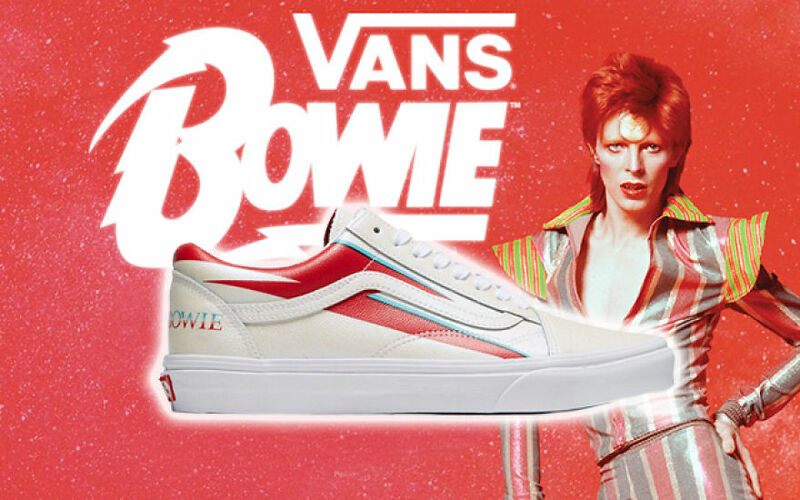 To celebrate his life, legendary skate shoe brand Vans launched a new limited edition sneaker range in tribute to David Bowie. Each model is like an ode based on a theme from a classic Bowie album, dedicated to celebrate his glam era. These are four different designs inspired by three different Bowie albums – Hunky Dory, Aladdin Sane, Space Oddity, and his most famous persona, Ziggy Stardust. And we must admit that all of them are must-haves! The ‘Era’ recalls the famous Bowie’s 7-inch single ‘Space Oddity’ released in 1969. Besides becoming one of Bowie’s signature songs, it is also one of four of his songs to be included in ‘The Rock and Rock Hall of Fame’s 500 Songs that Shaped Rock and Roll’. 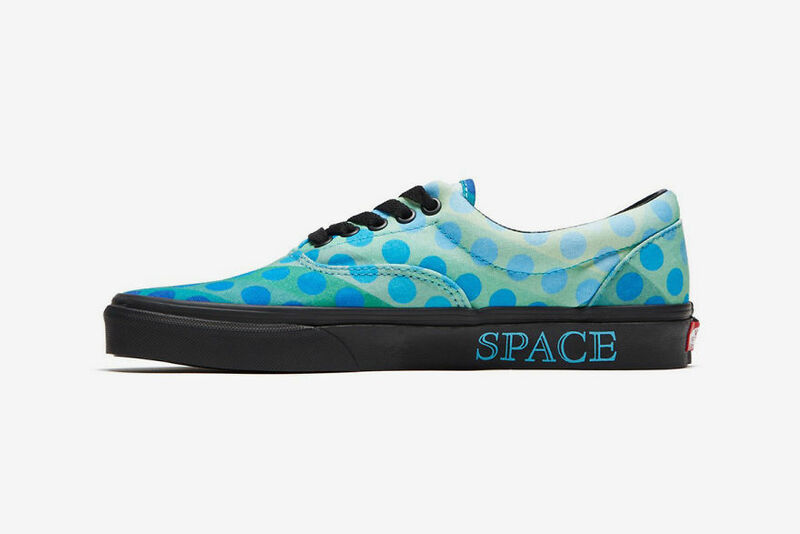 With blue polka dots and the word ‘Space’, the ‘Era’ sneakers have the same psychedelic pattern as the famous Bowie’s record. The ‘Slip-On 47 VDX’ will pay tribute to Bowie’s fourth studio album ‘Hunky Dory’ released in 1971, which was recorded in only two weeks, with the group averaging one song per day. Though this album was not a commercial success at first, it paved the way to Ziggy Stardust and the fame which followed after, so it’s definitely worth noting! The ‘Slip-On 47 VDX’ shares a similar color scheme – an unusual mustard yellow – as well as featuring a similar typeface show up. It also includes Van’s signature checks in a faux-fur style. 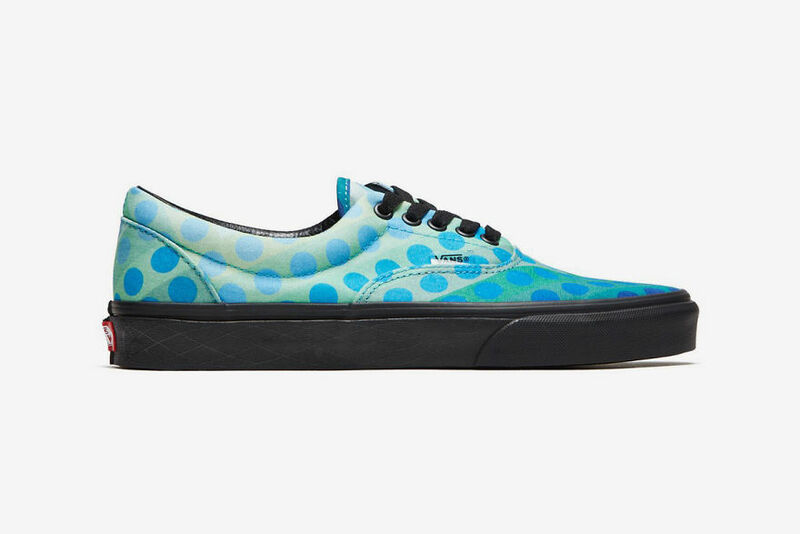 ‘The Old Skool’ is designed after Bowie’s sixth studio album ‘Aladdin Sane’ which was released in 1973. It’s worth to mention that this was the first album he wrote and released from a position of his long-awaited stardom. The white ‘Old Skool’ is cut in sleek leather and features his iconic lightning bolt. The ‘Sk8-Hi’ celebrates Ziggy Stardust era and his breakthrough record ‘The Rise and Fall of Ziggy Stardust and the Spiders from Mars’. Some may call Ziggy Stardust just a fictional character and nothing more, however, it was Bowie’s glam alter ego which rocked the world in early 1970. Let’s admit, the lightning stripe on the side panel of the sneakers and bold red typeface represents it perfectly! The sneakers are set to drop on April 4th and we can’t wait for their release! 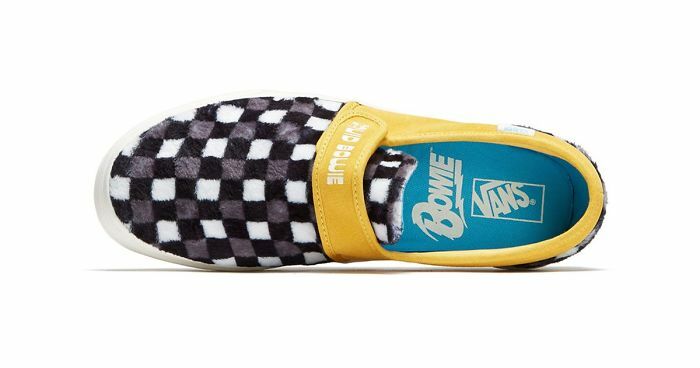 Cool how Vans is commemorating Bowie in these retro shoes! I love Bowie; I love Vans. AWESOME!! !